campers who are between 7-10 years old. The activities develop inquiry and design skills through engineering challenges. Campers are divided into two groups: Grades 2-3 and Grades 4-5.
Review the Online Registration Instructions at: Online Registration Instructions, especially if you are enrolling more than one child or enrolling for the first time. Note that each child must have an individual account and the enrollments are done separately within each account. If you need to create a student account, do so now before you enroll! Info in the Registration Instructions. If your child has an account already, do not create another! Do a test run for logging in and use the Forgot User Name or Forgot Password functions if needed. Complete the 2019 Summer Youth Program Registration Questions* before you enroll! This will save lots of time during enrollment. We also recommend families be familiar with all other information on the Youth Programs website. The website includes downloadable forms, a Family Guide, and much more information regarding UNH summer youth programs. We are looking for a teacher for the Grades 4-5 group this summer. If you are interested, please contact Sandy Coit at sandy.coit@unh.edu. Carmelina is joining KEEPERS for her second summer after having a magical first year in the Grades 2-3 group! 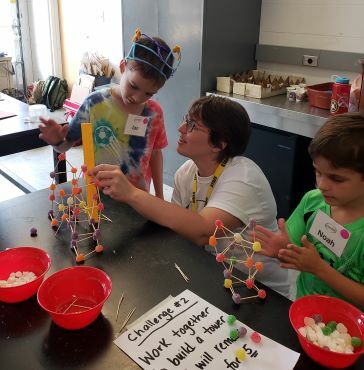 Her ability to excite the kids about STEM with fun, hands-on activities made it a great experience for our KEEPERS campers. 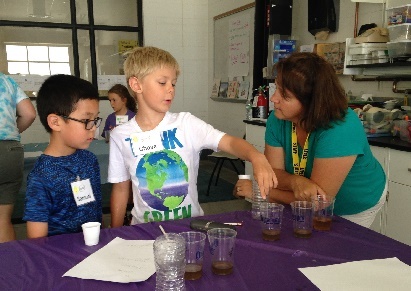 She has extensive experience as a science/STEAM teacher at the Barnard School in South Hampton during the academic year. Carmelina listening to the camper's plan for the design challenge. This will be Kiley's third summer working with KEEPERS camp. With her natural ability and enthusiasm for teaching young kids, Kiley will be a lead co-teacher in the Grades 2-3 group. During the academic year, Kiley is finishing up her first year of teaching science at Concord Academy. Kiley helping to measure a design challenge. The University of New Hampshire seeks to create a welcoming and inclusive youth program experience for all participants. Reasonable accommodation, consistent with the requirements of the Americans with Disabilities Act as amended, Section 504 and applicable state law, may be requested to support participation of individuals with disabilities in youth camps and other youth activities. If an accommodation is needed for any reason, please contact Cathy Leach, Summer Youth Programs, 603-862-3266 (phone); TTY Users: 7-1-1 (Relay NH); or cathy.leach@unh.edu. Accommodation request determinations are made on a case by case basis. Accommodation requests should be made at the time of registration, or as soon as possible thereafter to allow sufficient time for consideration and implementation.